It was in New Hampshire of 1910 when the first technical climb was completed and recorded in the United States. 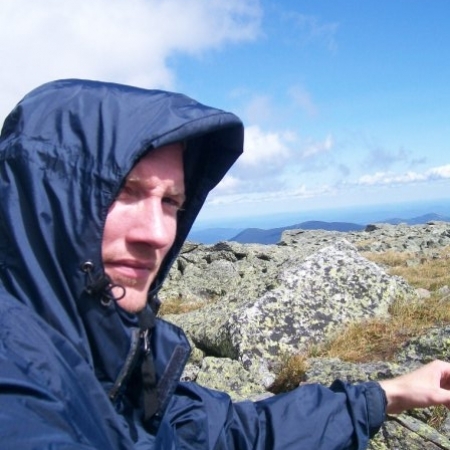 There, on the intimidating slopes of the Huntington Ravine within Mount Washington, climbing began. Were we there? No. Was our inspiration? You betchya. At EVO Rock + Fitness, we believe that we have all evolved from this larger history, and we invite you to join the evolution of this sport as it continues to amaze us. Historically, climbing has revolved around community and camaraderie almost more than climbing itself. Stories of sketchy ascents, near-death experiences, or sending a cruxy boulder problem cannot be told without talking about the people who were there. 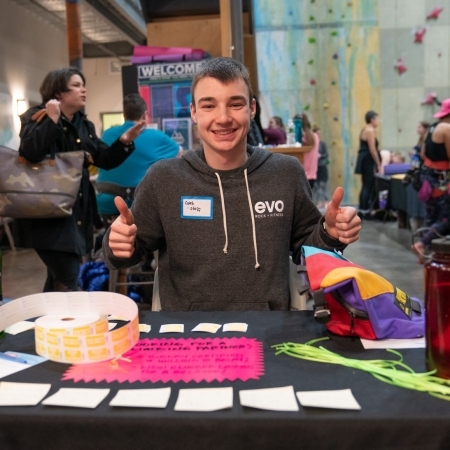 Profound relationships will always be an integral part of being a climber, and EVO celebrates this fact by hosting ongoing social events for the climbing community throughout the year. Our Portland gym is special because it evolved from the Maine Rock Gym, (MRG), built in 1994. The climbing community had gotten so big that the MRG needed to expand to a larger facility, which became EVO. The soul of the MRG community lives on at EVO with the ownership, the staff, and community. Regardless of who you are or where you come from, we’re all climbers, (maybe you just haven’t discovered it yet!) and we all play a part in this story…this culture…this ongoing evolution. Our Mission is Simple: Empowering people. Strengthening communities. Scott Howard was part of the urchin diving industry when he recognized the necessity for a climbing gym in Portland, Maine. According to Howard, many urchin divers were climbers, but had to travel far to reach a facility. He put his heart, soul, and bank account into creating the Maine Rock Gym (MRG), which came to fruition in September 1994. Howard credits the tenacity of Mainers to the completion of the MRG. However, as the community grew, he realized an even bigger and better facility was needed. He teamed up with Hilary Harris, Mike Lambert, and Keith Morris—momentum grew. 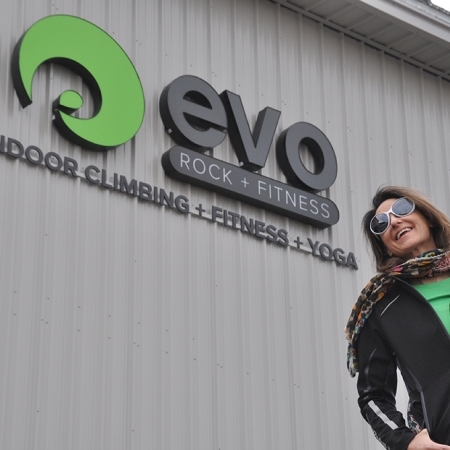 In 2015 EVO Rock + Fitness opened and there was much rejoicing. Howard’s vision for EVO revolves around what the climbing community needs to move upward and stay strong. In addition to helping manage the EVO squad, he runs a commercial greenhouse called Olivia’s Garden, and is also a fly fishing guide. In his spare time, he enjoys skiing, mountain biking, being with his 3 kids, and eating bok choy. Michael Lambert grew up sailing in Rhode Island but fell for climbing in 1995 when he moved to Arizona, where he obtained his B.A. in Adventure Education from Prescott College. When he graduated in 1999, climbing had become a pivotal part of his life. Despite some extensive globetrotting, Shagg Crag in Maine and Cathedral Ledge in New Hampshire remain two of Michael’s favorite spots. However, he says it’s the people, even more than the locations, that make climbing truly special; hence his excitement about joining the EVO team. His stoke thrives on Maine’s climbing community and anyone who’s looking to throw on a pair of shoes. Michael’s diverse experience as a sailing instructor, boat builder, sail-maker, arborist and small business-owner are invaluable; he’ll jump into anything from SketchUp architectural redesigns to building campus boards to playing Tetris with flooring. 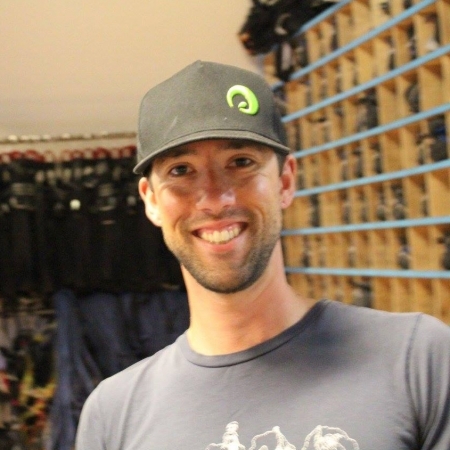 Michael’s high standards ensure that he will help EVO Portland continually grow as the sport of climbing flourishes, pushing standards in both the facility and the programming. Hilary Harris is both a long-time climber and licensed architect. Her climbing career started in Boulder, CO in the late 80’s. Gaining rapid recognition and success, Harris was one of a handful of women pioneers in the country, raising the bar on female standards in the sport. Harris has been coaching for more than 20 years and has coached youth to the World Cup level. She has also climbed and trained extensively throughout the US and Europe with the world’s top climbers. When she is not busy working on business relations you can often find her at one of the great crags in New England, hiking or sea kayaking the coast of Maine. 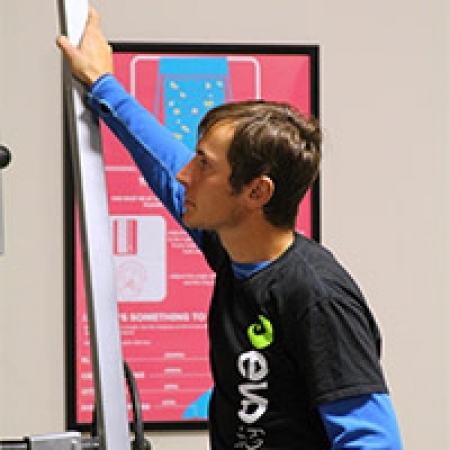 Cort Gariepy is a man of many talents and trades, whose work is all over EVO Rock + Fitness. From the front desk we check into, to the walls we climb on, and the chairs we sit in, Gariepy’s welding hand has touched everything. After designing and building the walls, he used the extra steel to make recycled-rope benches and arm chairs. He built the retail area, (with a pretty sweet LED back-lit display), and introduced Hilary Harris to Scott Howard, which pretty much got the whole EVO Portland ball rollin’. 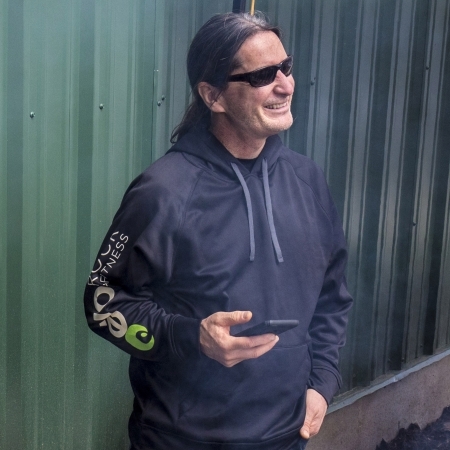 Keith Morris was born and raised in England but moved to Maine in 2004 to be closer to his family. His daughter was here in Portland, having married Scott Howard, who (at the time) was founder and owner of Maine Rock Gym (MRG). Morris bought half of MRG and became involved with the rock climbing community. He was thrilled when MRG and EVO Rock + Fitness combined forces, saying the best parts of MRG came to EVO. He enjoys every moment of the mixed environment at the facility. “Where else can you find rock climbing and tango?” Morris asks. Karen Abbott is a southern transplant from a small town in the Appalachian Mountains of North Carolina, and first found climbing when she was just 13 years old. Growing up in the Mountains meant growing up outside for Abbott, and it wasn’t until college that she experienced an indoor rock gym. After college, she traveled to New Zealand, then explored the great US of A, living everywhere from Montana to Hawaii—eventually settling in South Carolina. She’s been an executive pastry chef, a baking & pastry instructor, a teacher, and a business owner of her own cake company. 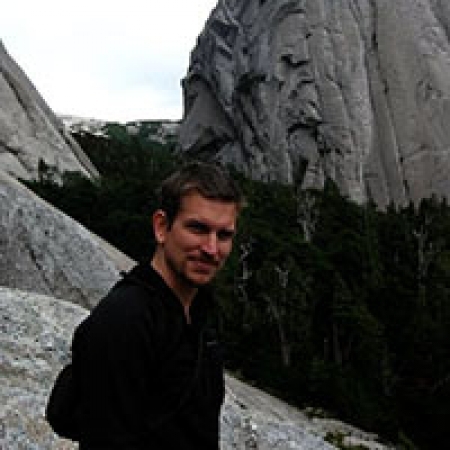 Chris Pert is a certified AMGA Single Pitch Guide and USA Climbing Level 1 Routesetter. 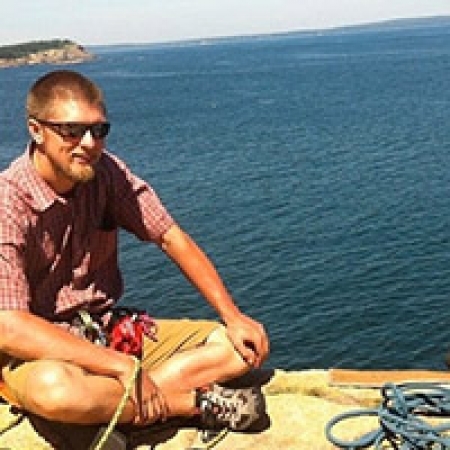 He was born and raised here in Maine and started climbing as a kid on the cliffs of Acadia. After completing his degree in jazz trumpet in 2005 (fun fact) he began working at a gym in Boston as Head Routesetter and climbing coach. 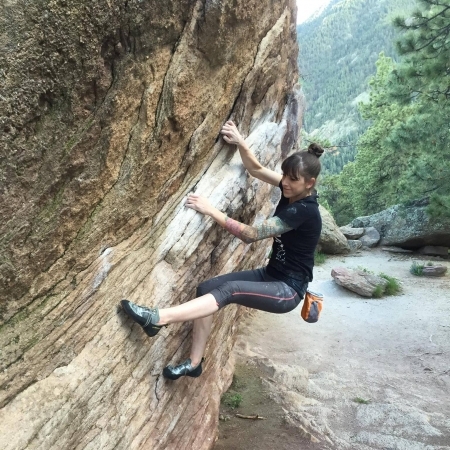 Joscelyn, originally from California, started climbing in 2014 at a tiny climbing gym in her hometown. She immediately fell in love with the community and hasn’t looked back since. 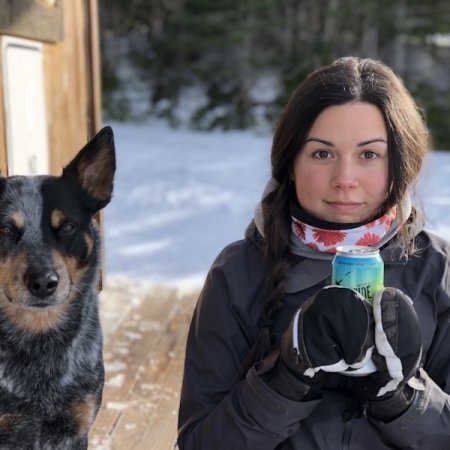 When not working at EVO, Joscelyn enjoys getting outside; whether it be climbing, hiking, backpacking, or just soaking up the sun. She also has a quirky pup named Bosley that is often moseying around the gym with her, don’t hesitate to come say hi! Chuck originally hails from the great state of New York but has recently made his home here in Maine… for a second time! A devoted husband and proud father of two, Chuck has been immersed in many aspects of climbing for 13 years. From trad to sport, bouldering to plastic, guiding to coaching: he’s had a hand in it. 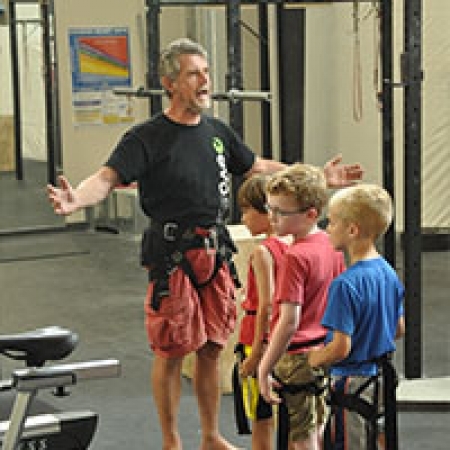 Here at EVO, you can find Chuck setting or coaching our kid’s Club EVO members. Route setting has been a cornerstone of Chuck’s skill set for many years. However, he still strives to grow and evolve every time he picks up his drill. Trevor grew up bouncing around the U.S. but finally settled in Maine, where he discovered his love for climbing at Maine Rock Gym. He was instantly hooked, and his love for the sport only grew while attending college in Boston. 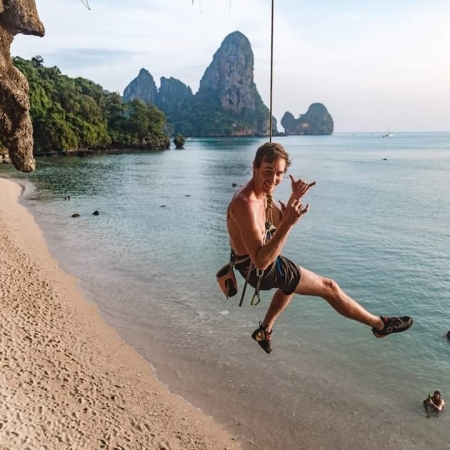 It’s now been 10 years and Trevor’s climbing has taken him all over the world, introduced him to some of the best people, and supplied him with memories to last a lifetime. His favorite thing about climbing is seeing people push their limits both physically and mentally. Trevor is always looking to share his passion for climbing with others! If you see him around the gym, don’t hesitate to ask questions or even just talk beta. Chris Kelleher moved to Portland in 2014, where he discovered climbing. 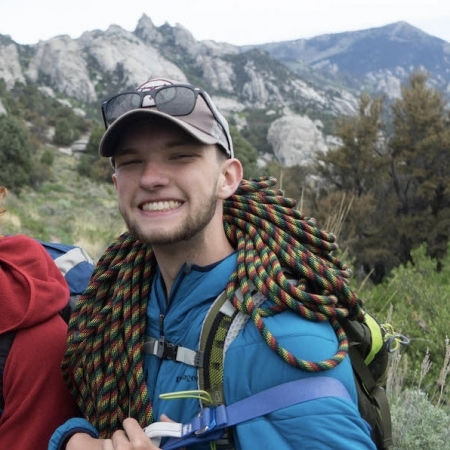 Kelleher loves the peace, serenity, and challenges climbing brings to his life. When he’s not working at the gym, he’s dedicating time to a local nonprofit called Boys to Men; not to be confused with the 90’s boy band. He also works for Family Crisis Services, based in Portland, and was covering someone’s shift during this interview so a fellow coworker could go climbing. He’s just that kinda guy. Random fact: he spent the night camping in the second coldest temps ever recorded in New Hampshire and now his fingers don’t feel the same. Caleb grew up in Maine and discovered his passion for rock climbing back at Maine Rock Gym when he was just 10 years old. He loves the climbing community, teaching others about climbing, and appreciates both the exciting and calming aspects of climbing. Caleb joined Team EVO (our competitive youth team) upon our opening in 2015 and enjoys traveling with the team and climbing at new gyms! Caleb’s advice to the new climber? Ask questions, questions help you progress! 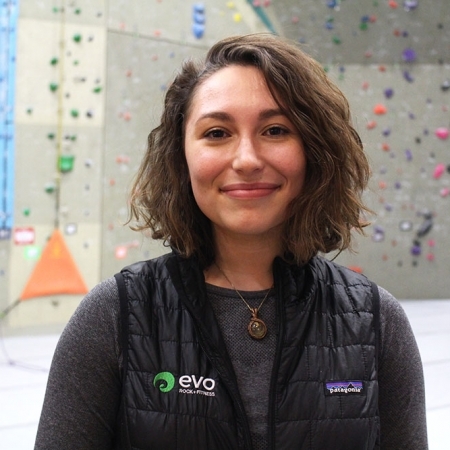 Carly grew up in Southern Vermont and moved to Maine 6 years ago where she began her climbing career right here at EVO in 2015! 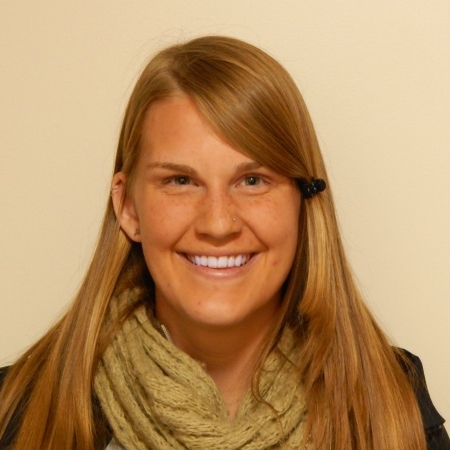 She recently completed a masters degree in occupational therapy and is passionate about health, environmental sustainability and the great outdoors. In her free time, you can find her hiking, biking, kayaking, or anything in the fresh air. Carly’s advice to a new climber? Whenever you feel stuck on a route, look to your feet! EVO Rock + Fitness has been designed and built to the highest environmental performance standards of any climbing gym in New England. We started by designing a building that is oriented to the south so the building can optimize daylight and solar heat gain during the winter. During the summer months, the sun can be more easily controlled on the south side, which ensures that we can keep the building as cool as possible before turning on the AC. Our mechanical system meets high-efficiency ratings above and beyond code requirements. During the summer months when there is a demand for cooler air the system is designed to bring in outdoor fresh air that is able to cool the building naturally. Our air filtration system is designed to filter the chalk that is generated in a climbing gym, so it goes into the filter and not your lungs! Our lighting systems use the most efficient fluorescents available on the market along with LED’s in select locations. The fluorescents are modern with high-quality color rendering which makes people look like their natural selves instead of the older type of lights that make the skin look green. Our interior finishes are non-toxic, emitting very little amounts of volatile organic compounds; this keeps our indoor air clean and fresh to make your workout the best it can be. EVO is always excited to bring new people to our tribe. We are a visionary company that believes our evolution hinges on having the best team possible: upbeat, professional humans who have fun, climb, and check their egos at the door. We are seeking staff that is self-motivated, organized and want to be a part of the larger community of climbing and fitness. If there is not a posted position that you are currently interested in, please submit your application, and we will keep it on file for when an opening becomes available.